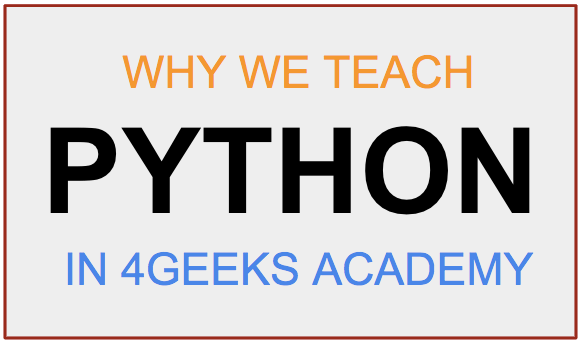 Why 4Geeks Academy teaches Python as Backend Language? It’s true that a Java software developer has a better chance to negotiate higher salaries; however, Python is used by more companies and industries because of its versatility. The real challenge for coding bootcamp graduates is getting hired the first time. The second one is 1000% easier and your salary will begin to rise faster after your first year of experience. Python is used by MIT to teach coding because it has a very simple and clean syntax: No semicolons, not braces, etc. 90% of junior developers errors are closing braces or missing semicolons. It is almost like speaking in English: Reading a python code it’s a lot easier than other languages because its syntax is closer to English. According to some reports (W3Techs, Similartech, and many other market research firms), Node JS is only used in 0.3% of the web. On the other hand, PHP rules the web with 80% of the market. However, when you think about software in general, Python rules all the other industries, being used by almost every enterprise in the world and everyone trying to experiment with machine learning, AI, etc. That means almost every company in the world according to Forbes. Basically, after analyzing all the data and taking into consideration multiple factors, it is almost a no brainer choosing Python as one of our main components within our Stack in 4Geeks. It is our humble opinion to strongly encourage any academic institution out there to follow the world leaders and finally adopt Python as their backend language for teaching code. Interested in learning to code?